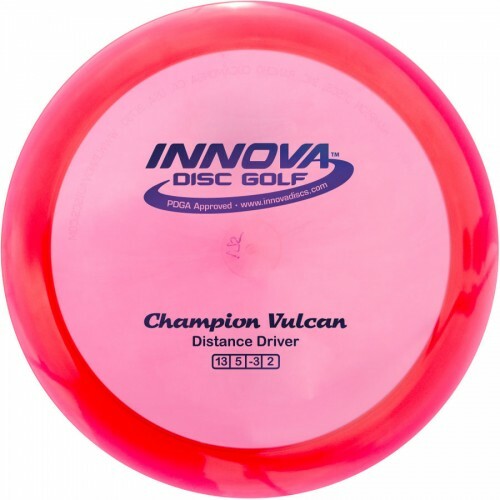 The Innova Champion Vulcan is an understable distance driver that was designed with the less powerful disc golf players in mind. The Vulcan flies similarly to the Katana with less low speed fade. (The Katana is less understable or more stable than the Vulcan.) The lower weights are great for longer shots. The Vulcan makes a great first speed 13 disc golf driver for beginners. For skilled players, it's a great long turnover driver. It makes a great long range roller too. The Vulcan is high speed with a bunch of turn! Beginner friendly. It is a great choice for high powered rollers and it is easy to throw far.